To enter, head on over to our Facebook page and please upload a video of yourself, friends or family playing a piano (including electronic keyboards, organ, synthesizers and/or IPad apps). You can vote for as many videos as you want but votes for a specific video are restricted to one vote per video per day. The Contest will run for 5 weeks. You have 4 weeks to upload and everyone has 5 weeks to vote. The starting date is midnight November 12th and the last day is December 12th. Winners will be announced over the weekend of December 12th. Good Luck to everyone. Click The Link Below To Be Directed To Our FaceBook Page!! PianoTV VIDEO Tour Click Here! 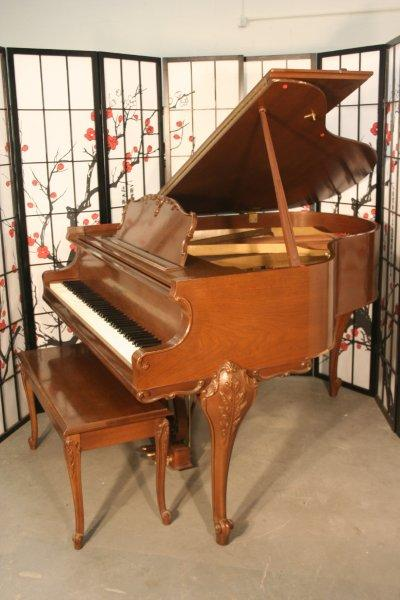 Pretty Walnut Art Case Kranich & Bach Baby Grand Piano, 1970, just refurbished, regulated and received French Polish. Low mileage, one owner, excellent condition. Warranty. Questions? Call Sonny Direct 631 475-8046.